The World Sacred Music Festival in the city of Fes , Morocco. The World Sacred Music Festival is the highlight of the Spirit Foundation of Fes, Morocco. Thanks to its influence and vocation, the festival is part since 1994 in a universal mission of peace and reconciliation among peoples. During ten days, various events and parties are given in all the monuments and important site in the city. Each year the festival welcomes a multitude of artists, who come from all walks of life and all cultures. 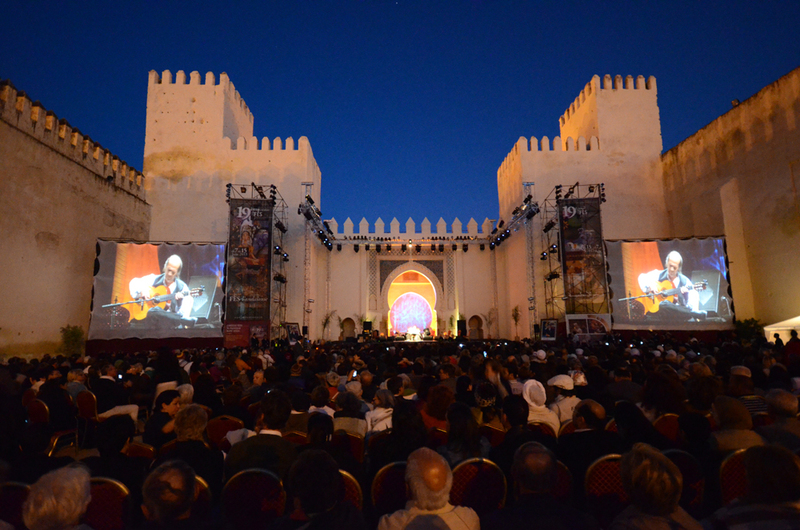 The World Sacred Music Festival and the Forum of Fez, created respectively in 1994 and 2001 , are part of the scholarly tradition, artistic and spiritual town. Since their creation, these events have had a growing success. This festival was designated in 2001 by the UN as one of the key events that have contributed in a remarkable way, the dialogue of civilizations. Meanwhile, it has developed an international network of support and media coverage. Thus was born, the United States , the organization Spirit of Fez Inc. , which organizes every two years a program of the Festival and the Rencontres de Fès through twenty US cities. A tour was organized during the months of October and November 2006 in several cities of the United States, including a concert in New York at Carnegie Hall. Diffusion through these events, this “spirit of Fez”, now radiates from Fez in different places of the world. Several other cities such as Milan , London or Madrid wanted to become a relay to extend the festival’s message and meetings of Fez : the dialogue of spirituality through music, creating a culture of peace promoted by globalization plural, respectful of ethical and spiritual values. Its current director is Faouzi Skali .